This flexible night&day system includes sofas and beds. 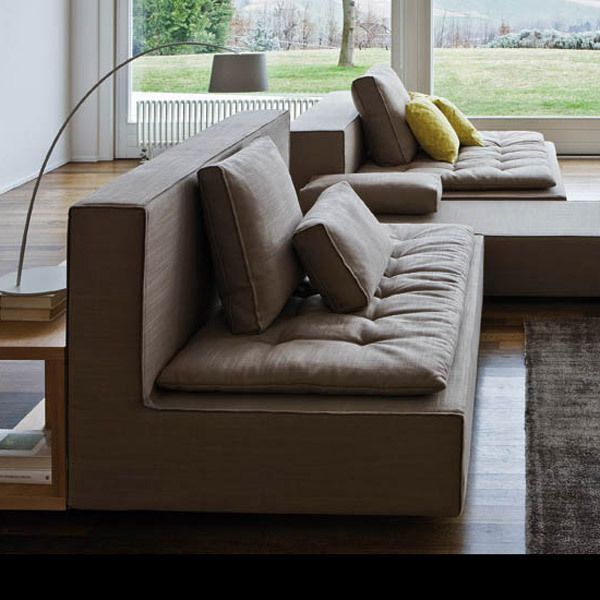 The sofas are accompanied by light quilts with the double function of increasing comfort and adding a decorative and soft touch to the linearity and formal essentiality of the system. Poufs, trays with or without leather inserts and side bookcase-cabinets complete and enrich the compositions. The Domino collection is modular and can be assembled to one's desire starting with the standard elements. It is inspired in part by Turkish sofas (positioned in the centre of a room) and in part by the versatile Japanese Tatami system. Like Tatami, it can be a chair or a comfortable support to rest on, depending on the layout: from a bed to a sofa, to a relaxing island. A flexible system that transforms and adapts to our nowadays' wandering life. The night version allows the mattress to be positioned asymmetrically on the base, thanks to the addition of a bench module along the entire length, which acts as a frame and creates side space for books and accessories. When used as a sofa, the same longitudinal bench piece becomes a flexible work surface to read on or to carry a PC. A series of cushions of different sizes and thicknesses completes the large Domino "family". Flexibility also characterizes its use: from the home to the theatre, from the hotel foyer to the exhibition area and cruiser liners. Moreover the Domino coffee tables/bookcases can also be combined and connected to many other sofas in Zanotta's collection such as Kilt, Beta, Gamma and Delta.